We have a popular range of blue and white hand towels that is sure to be exactly what you need. For any other help or if we dont have what you need feel free to contact us directly. 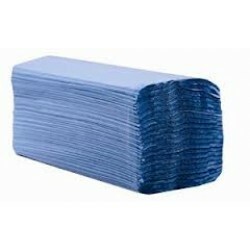 Blue Multi Fold Hand Towels 1ply (3000 pack) White multi-fold hand towels are suitable for all wa..
Centrefold hand towels2800 in a case1 ply blue..
White c-fold hand towels are suitable for all washroom environments White c-fold hand towels are av..
White Multi Fold Hand Towels 1ply (3000 pack) White multi-fold hand towels are suitable for all w..
ESP Auto 165 White 1Ply through air dried Roll Towel (Fits in the Kimberly Clark dispensers)Length16..